The militarisation of youth does not go unnoticed and unchallenged. When War Resisters' International initially discussed how to respond to the challenges of changes in military recruitment, we were encouraged by the long and inspiring history of counter-recruitment work in the USA. However, recruitment itself is only the tip of the iceberg. It is the end result, the crop, whose seeds are sown long in advance. Militarisation does not only lead to an environment favourable to recruitment, it is also needed to prepare and maintain the public support on the 'home front' for war and the military. There are many inspiring examples of work to counter the militarisation of youth, and this website is profiling many of them (see below, and also Inspiration for Resistance). Several schools in Germany have declared themselves "military-free", denying the militar access, and not participating in events organised by the military. In the US, limiting recruiter access to high schools and universies has been one of the main "battlegrounds" between the military and the counter-recruitment movement. But formal education is only one example. Queer activists are countering the military's outreach and recruitment attemps within LGBTI communities, for example through participation in gay pride events. NGOs internationally are fighting the recruitment of child soldiers. The role of War Resisters' International as an international pacifist and antimilitarist network is to foster debate, to facilitate exchange or experiences, and to stregthen the networking of antimilitarists globally working against the militarisation of youth. We hope this website contributes to that! 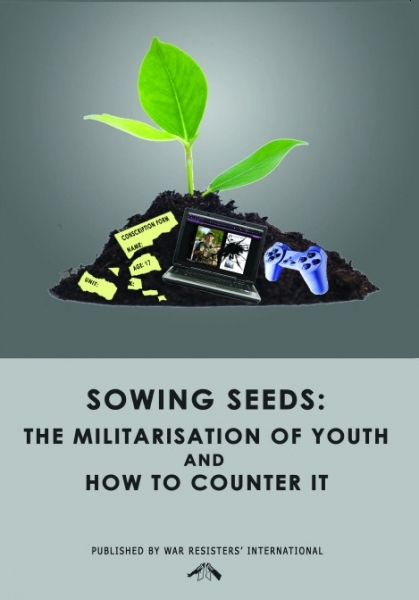 Between June 10 to 14, 2013, War Resisters International and the New Tactics community joined together to hold an online conversation on tactics for combating the militarisation of education, public spaces, vulnerable communities, entertainment and culture. This video was used in the crowdfunder campaign for WRI's Countering the Militarisation of Youth work. Groups opposed to the drafting of Christian Arab youth into the Israel Defense Forces, including the youth wing of the Hadash party, staged a protest rally in Nazareth on Saturday in which male and female teens marched into Spring Square in the center of town dressed in military attire and carrying toy rifles. 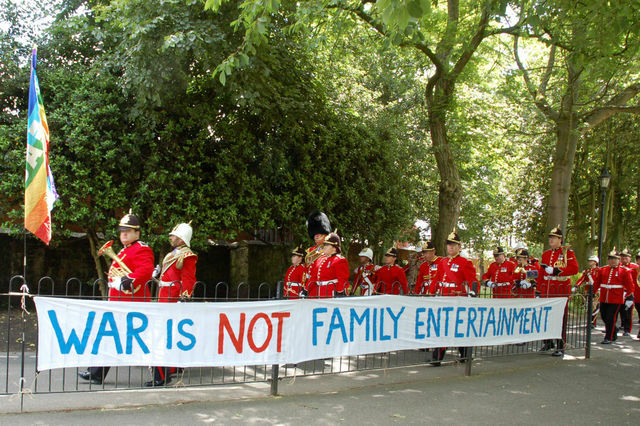 After a fortnight of fruitless communication with Wrexham County Borough Council over its support for and promotion of an event that we knew would be used by military recruiters to target young children, a small group gathered on Llwyn Isaf on Saturday with a 'Peace Presence' at Armed Forces Day.